It may be that you’re temporarily in a really tricky situation and you just need to get out the other side of it. But if not; if that sense of not being able to keep up at work is persisting longer than it should, take a look at these short tips for breaking the pattern. And once you’ve identified them, do these first thing in your day, or do them in your quality time, or scrub-out something else. Remember, you’ve either chosen to work on your own priorities, or you’ve chosen to forward somebody else’s agenda. Identify what level of %age completion/quality is right for the task you’re involved with and don’t go 1% over. Perfect is the enemy of good. Make sure you’re only delegating ‘outcomes’ and not telling people how to achieve those outcomes. Be prepared to live with people taking a different approach to the way you might have done it. This is the ONLY option if you don’t want to, or can’t, do everything yourself – which you don’t and cant’! It doesn’t work. It DOESN’T work. Email is for communication, not task-management. Get a simple to-do app and use that instead. If your email in-tray is overflowing, make a separate folder, dump everything into there and start again with a blank in-tray, this time using a separate app to record to-do’s. R is for Reading – can you read an item in 5 minutes or less – and do you really, really need to read it? If so, read it when it arrives, otherwise, bung it into a Reading File and wait ‘til it’s a priority. Or Trash it. A is for Action – can you action item in 5 minutes or less – and do you really, really need to do it? If so, action it when it arrives, otherwise, bung it into your To-Do app and do it when it’s a priority. Or Trash it. F is for File – can you file an item in 5 minutes or less? If so, file it now. If not, wtf is it!? T is for Trash – this is my favourite. Trash it. Hit delete. Gone and forgotten. Should be your default setting – can I legitimately just hit delete or chuck this in the bin and not get emotionally-hooked. Rather then over-schedule and under-deliver! This is strongly linked with Items 1 and 12. The best way to do more is to try and do less. Focus, focus, focus. How jammed is your calendar, how hectic is your travel schedule? “Less is more” people. Not only is this a good way to get and stay engaged with people, you’ll end up with new and different solutions that you wouldn’t have thought. Takes a bit longer in the short-term, delivers better quality and takes the load off of you in the medium-term. All leaders should be able to say what the strategic aim for their organisation or department is. “What we need to do is X, Y and Z.” Repeat this whenever and wherever until you’re sick of hearing it. And then repeat it some more. This way of simplifying really helps others to get behind the programme and take-up more of the effort themselves. You’ll be more than pleasantly surprised when you hear people repeating your mantra unprompted. And the more senior you become, the less you should be working on tasks and the more you should be working through people. Check how your current balance is on this and see if you need to spend more time leading and less time doing. See also 10 below. What Outcomes are they working towards? What’s in the Current Situation that you and they need to be aware of? What Approaches have they tried or do they want to take? What Support do they need? How will you know when it’s Worked? I bang on about this all the time. Relationships are the key to getting stuff one in organisations. “It’s not what you know. It’s not even who you know. When was the last time you prioritised coffee with a colleague just for the sake getting to know each other better? So often we under-estimate what can be done in the long-term and over-estimate what can be done in the short-term. The key is to plan on all three time-horizons. What’s my priority for this year, for this month, for today – and how do they link together? I hope those help a little? Give me a shout – add a comment below if they’re still open, contact me here, or tweet me @NickRobCoach if there’s something not covered or if you’d like to add one of your own tips. I don’t see people giving enough encouragement and approval at work right now. Here’s why and what to do about it. I don’t see enough moral support being offered around these days. Either from leaders to their people, or just between colleagues. I mean, easy things like giving someone an affirmation: “I know you can handle this,” or offering a willing ear to really listen to what might be bothering someone. Is it a sign of the times maybe that these simple human acts of encouragement and approval have somehow slipped from the top of our leadership and managerial agenda? Couldn’t be clearer to me! Here are some of the barriers I’ve observed that get in the way of leaders and people in general offering more moral support to others. And what to do about them. What does offering ‘moral support’ even mean? This is an important barrier. If you haven’t seen moral support in action, or it isn’t something you’ve too much experience of receiving yourself, then the whole idea of ‘moral support’ can seem quite alien or difficult to define. But you can break that chain. Another big barrier, and often the first thing that leaders say back to me when I raise it as an issue. The person who needs moral support from you isn’t someone that you trust absolutely. You’re not really sure that they can do what’s being asked of them. You don’t really like the way they are. “And I’m not prepared to lie to them,” you’ll say. For me, this is a practical and a creative issue. On a practical level – has the opposite approach worked? Have you successfully managed to coax the best out of this person by NOT giving them any moral support? Has doing the opposite worked well for you – telling them that you don’t trust them, don’t approve of them, don’t have faith in their abilities? Find what is true. Look hard enough to find what you can trust, what you can approve of. Be brave and trust yourself enough to take a risk, and tell them that even if they stumble at some point, you’re confident that they’ll get up and carry on; that you’ll be there if they need you. Stop complaining and raise your own game – when you take a small risk and try it, you’ll be great at it. Who am I to offer moral support to others? We need to take a baby-steps approach to this barrier. First, it’s not about you, it’s about the other person. What do they need to hear from you, about them? Yes, it really helps if you are the kind of person who does believe in yourself and does act with integrity. And, people don’t really need to hear what you think about yourself, they want to hear what you feel about them. Second, do the work yourself. Do the work. Take small steps to become the kind of leader who does what they said they would. Work on your confidence by admitting to your secret doubts and then learning to co-exist with them. Over time, learn to trust yourself completely. First in a series based on my current reading. These aren’t meant as book reviews or critiques, just as a summary of my own personal learnings that others might also find useful. I’m lucky in that my coaching clients often send or recommend me books that they’ve found interesting. Please feel free to mention anything you’ve been reading that covers, in the broadest sense: leadership, management, coaching or other personal development and growth. Use the comments box below or tweet me @NickRobCoach with any suggestions. Ant Middleton might not be everybody’s favourite cup of tea, but I don’t think you have to like everything about a person in order to learn from them. Buddhists have a saying: “Take what works for you, and leave the rest”, which is how I invite you to read this book for yourself. Check it out for yourself and explore your own views on this undoubtedly charismatic and driven man. The Guardian chose to write a ‘humorous’ digested take on this book, rather than review it, which you can read here. It’s not particularly complimentary – although that’s probably because this book is not aimed at your average Guardian reader. 1. Always have a plan. This is a great one and totally aligned with the coaching principle of being outcome-focussed. One of the first things I check with any of my clients who are stuck or struggling is just this: have you got a plan? I believe that often the solution to any difficult situation is: make a plan, stick to the course without giving up, deliver the plan. 2. Failure isn’t making a mistake; it’s letting the mistake take over and redefine who you are. Us coaches are fond of pointing out that the only way to never make a mistake is to never do anything – which is itself a mistake! Ant Middleton says that mistakes should be accepted, self-recrimination pushed to one side rather than being allowed to run the show, and a new plan formulated. I’ve seen this before in highly-trained professionals. They never recriminate about mistakes (although they almost always take time later to review and learn from them). Instead, their immediate focus is always on making good what has gone wrong. Good stuff! AM says that your body often tells you that it’s got nothing left, when it’s still a hundred miles from breaking. And, even when it does break, it’s also designed to heal! He says most of the battle is in your mind. I’d say that it’s worth testing your body well enough to be able to tell when you’ve reached a real physical limit, and when you haven’t. We often want to act, to dive in and be doing something. Often because that’s less scary than sitting with the fear of the unknown that comes from not knowing how things will work out. AM says that waiting, waiting for things to come to fruition, or waiting for the right time to act, is a vastly under-appreciated strategy, especially when part of a plan. Be actively engaged in the process of addressing those aspects of yourself and your situation that you want to change. I hope you get the chance to check out this interesting book for yourself. I got mine as Christmas present and found it a quick, easy and enjoyable read. My teenage son and I love watching the TV series ‘Who Dares Wins, also led by this author, which does a brilliant job of creating an environment in which people can really test and learn about their physical and mental resilience. Inspiration: 12 things to do every time if you want to go beyond your previous limits – in the form of a poem! In the end, it more or less wrote itself anyway. Very early one dark, rainy Monday morning when I was feeling great about things. Full of determination and ready for the week. Looking at it now, I’ve laid it out a lot like a poem, so, I guess that’s what it is! How’s your Physical Intelligence – and how does this affect your ability to lead others? Gardner describes this as control of one’s physical movement and the capacity to handle objects skilfully. This also includes a sense of timing, a clear sense of the goal of a physical action, along with the ability to train responses. He believes that people who have high bodily-kinesthetic intelligence are generally good at physical activities such as sports, dance, acting, and making things. Click here to see Gardner’s book on Amazon (not an affiliate link). Whether or not you believe it’s actually an ‘Intelligence’, you’ve probably been around people who are really great at using their bodies. They can hit a tennis ball right by you without seeming to try. Or they can insert a needle into a worried patient’s arm in one easy motion. Or they can make great choices about their own physical health, in a way that sustains them really well. What other kinds of physical intelligence or smartness have you noticed in yourself or others? First, a ‘Capacity‘. This is like the limit of your own intelligence (whether it’s Intellectual, Emotional or Physical etc). For some aspects of each of those intelligences, research suggests that your capacity is fixed – that is, it can’t be increased. What you’re born with may be what you’re stuck with. For other aspects, your capacity can be increased – you can stretch the limit and develop new capacities. Second, there’s a ‘Utilisation‘. This is how much you use your current capacity. If you want to improve your intelligence, be it Intellectual, Emotional or Physical etc, making sure you’re actually already using all that you can use is probably the best place to start. As I get older and my body stops taking care of itself quite as automatically as it did when I was younger, I’ve become more interested in aspects of physical intelligence. I’m lucky to have a wide spread of ages and occupations and interests amongst my coaching clients, so this is something I often just get a little curious about with them. What do they do to take care of themselves physically? How does their physical being impact on their presence as a leader? Are there links for them (as the evidence seems to suggest) between their physical intelligence and their emotional resilience? If I bring to mind a dozen or so people I know really well who I’d regard as great leaders, it seems pretty clear to me that they have a good range of several of Gardner’s Intelligence Modalities. They’re smart people and they’ve worked at that. They are good at building relationships with others and they’ve worked at that too. And they all do something to maintain or even increase the utilisation of their own physical capacity. What’s also interesting for me, is the range of things that these leaders do to utilise their physical being. There’s all the middle-aged cyclists of course. And there are swimmers and runners and tennis players and footballers and hikers and so on. But then there are also dancers and yoga practitioners and tai-chi masters and Nia movers and Five Rhythms people. The range of things that people do to be in great relationship with their bodies is huge. This is not just about “fitness” – although being fit certainly seems to be part of Physical Intelligence. It’s more than just that though; it’s also about being aligned with and being fully part of our physical being, our bodies, as well as our mental and emotional existence. Without that, it’s hard to be a complete person – which is another important aspect of being a great leader. It also seems to me that people who have a good relationship with their own bodies are more confident in their dealings with others, are less likely to get hijacked by their own knee-jerk responses and are generally happier and therefore more pleasant to be around. What’s your view? Does your physical intelligence have anything at all to do with your ability to lead others, or to be successful in your work? What’s the key? If you believed that physical intelligence IS important to leadership and general success at work and in life, and you wanted to improve your own where should you start? In my personal experience, it’s all too easy to make this difficult. In the past I’ve managed to fill my own attempts to get physically smarter with all kinds of unhelpful beliefs about how much ‘should’ be possible for me. Or about how I need to keep the shambolic, beginner stages private. Or I’ve even fallen into the ‘no pain, no gain’ trap! If we reflect back on my earlier points about Capacity and Utilisation, we’re actually talking about learning new stuff here – even if, in this case, it’s our bodies that are doing the learning. And the best learning is messy, playful, gentle and spontaneous. Is that the way to improved physical intelligence? 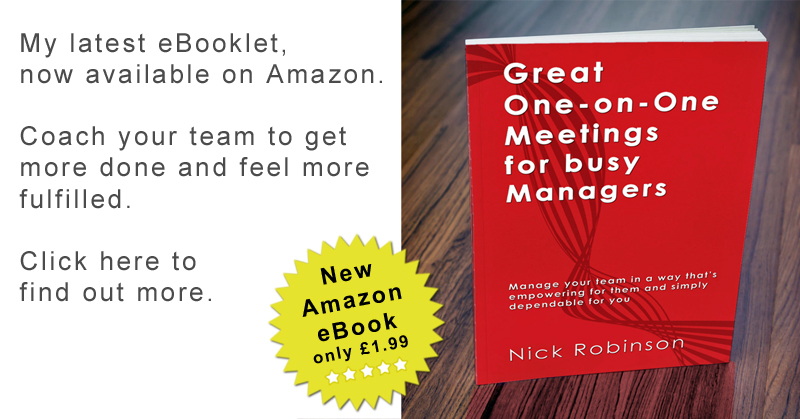 Can you meet whatever situation life and work sends you – and show others how to do the same? Resourceful people can. Resourceful people have the initiative to grasp opportunities and the ingenuity to overcome their challenges. They can make powerful decisions and help their teams and colleagues to do so too. We have a principle in the kind of coaching I do which is about regarding everybody as resourceful. How does this person regard themselves and the people who work for them? Do they think of themselves as someone who is able to meet whatever situation arises, and who is ingenious enough to devise ways and means to overcome problems? And do they think the same of their team and their colleagues too? Perhaps one of the main reasons why regarding yourself and others as ‘resourceful’ is so important, is because the alternative is really awful. The alternative to regarding people as resourceful, is to see yourself and others as somehow fragile and dependent. Now, it’s true that if you bend anyone hard enough and fast enough then they might break. But that is in no way the same as being ‘fragile’. And what’s more, breaks can be mended. And it’s also true that we are all, in some way, dependent on the people around us – like the poem says, “No man is an island” – but having those kind of human links, having dependencies, is not the same as being dependent, as being unable to function at all without others. One of the loudest complaints I hear from poor leaders is that their people: “… aren’t resourceful enough”. They wonder why nobody works as hard as them or why their team: “… don’t show more initiative”. The years have taught me that this is a 90% certain sign that this leader doesn’t regard other people as resourceful. And usually, when I get the chance to dig a little more with this kind of leader, we find out pretty quickly that they don’t really feel resourceful themselves either! All of us have times when we lose sight of our resourcefulness. Perhaps we’ve been stretched too far out of our comfort zones too fast or for too long. Or perhaps we’ve gradually had things pile up on top of us to the point where it’s difficult to remember just what we’re capable of. It’s taken me a long time and lots of getting it wrong along the way to discover just how important this idea of resourceful actually is. Think of it like this. If it was possible to choose between two alternative points of view, which of these do you feel is likely to be most useful? In general, me and/or the people around me are capable of meeting whatever situation arises and are skilled at solving problems. If you could choose – which of those viewpoints would you have? Us coaches tend to be very practical people, so we look for what works. And over the years I’ve tried a lot of things that don’t work! Now I’m pretty certain that the best leadership approach is to regard myself and others as fully resourceful. The principle in my coaching work is that everybody has a natural ability to resolve the challenges they face and to grasp the opportunities around them. First, that the word itself comes from the Latin ‘Resurgere’ – which means “to rise again”. Right there in the word is an important clue. Being Resourceful does not mean never falling, it’s about getting up again when you do. Second, being Resourceful is a ‘capability’, something which can and should be developed, learnt and practised. I think we’re predisposed to actually look for evidence of where ourselves and others are not Resourceful. Maybe this is even more prevalent at work. Perhaps it’s because the consequences of not being Resourceful can be (or seem to be) dangerous; and that we need to compensate for them. I’m not bothered by that, it seems a natural thing to want to do. But if we want to experience more occasions of ourselves and others being Resourceful, then we’ve got to start looking for evidence of when it IS happening. What would you see, hear, feel or otherwise notice that would let you know when you’re being Resourceful? What enables me to be Resourceful? What is necessary first, in order for me to be Resourceful? When I am Resourceful, what does it lead to or make possible? Why is being Resourceful important? Your answers to those questions are the cornerstones of what some people would call an ‘empowering belief’ (kind of the opposite of a ‘limiting belief’). They’re at the heart of what might motivate you to be Resourceful, and they’re the primary clues to changing your behaviour if you want to be more Resourceful. So spend as much time exploring them as you can! The stuff that we’re (usually unconsciously) afraid of is what most often derails our chance to be Resourceful. Being afraid of getting something wrong stops us from trying. Being afraid of looking stupid stops us from taking a risk. It’s hard to be Resourceful when your unconscious mind is afraid of what might happen if you try! Making choices, intentionally and consciously, is a very powerful (and resourceful) thing to do. Otherwise we let habit, fear and expedience run the whole show. In order to be Resourceful, what three things do I choose to say “No” to? In particular, what do I choose to say No to being, to say No to doing and to say No to believing? In order to be Resourceful, what three things do I choose to say “Yes” to? In particular, what do I choose to say Yes to being, to say Yes to doing and to say Yes to believing? Remember that there’s a dynamic aspect to being Resourceful. It isn’t just a static thing, it’s about rising again when we’ve fallen or when we’re stuck or when we’re faced with another fresh challenge. What does each part of that dynamic process feel like in your body? What do your muscles feel like? What’s the temperature of it? What feelings do you notice in your gut, in your face, elsewhere in your body? When you get to the most Resourceful part, what does that feel like? And where in your body is the centre of your own version of Resourceful? Daft as it may sound, getting to know what your own experience of Resourceful is like in this way can be a really helpful and grounding approach. Don’t do all of this stuff on your own. I’m a very independent person and I respect other people who like to do things by their own efforts too and I know that it really helps to be wise enough to share some of it. You can learn from, lean on and bounce stuff around with other people in a way that just isn’t possible by yourself. Finally, I said earlier that everybody has that natural ability to resolve the challenges they face. The best way to bring that out in yourself and in others is to experiment with it. Find opportunities to be Resourceful. Get curious about what that’s like. Practice doing it like your favourite sports person would practice their skills. When you notice something isn’t working, adjust part of it, and practice some more. Today there’s a lot of emphasis put on being a good leader in organisations of all shapes and sizes. This is only right; leadership is one of the things that can make the difference between a business or an organisation being just OK and being great. What I think leadership can’t do on it’s own, is to take a business from being new or poor to being OK. Or to sustain greatness once it’s been reached. To do those things, you also need great management. I sometimes see individuals and organisations making the mistake of thinking that leaders and managers are different people. Maybe it’s an ego thing? Or something sensible to do (at least on an individual, short-run level) because maybe ‘leaders’ are considered more important than or get paid more than managers? Whatever the reason, I reckon that a better way to think of it is as the way that people in your organisation spend their attention. Right there we can see that the very definition of management actually includes leading – that is, leadership is a subset of managing and not a replacement for it. As you get more and more senior in your organisation the focus of your attention should shift away from the “Stuff” that’s involved in doing the Planning, Organising and Controlling that Fayol described. Now you need to give more of your attention to People. And that’s where your skills as a great leader come in. You have to do this. A lot of my coaching work is about helping people to make this transition, to shift their focus away from managing the stuff and towards inspiring and empowering people. However, this doesn’t mean that you do no management at all as you get more senior. In fact, I’d argue that the smaller amount of your time and attention that remains available for managing means that you need to be really, really efficient and effective at it. Your Planning and Organising needs to be spot-on AND to include other people, so that they can contribute to and buy into it. Your ability to Control (monitor, feedback and adjust) has to be light-touch, well-connected to the overall purpose of the business AND flexible and robust enough to adapt to external conditions. As you make that essential shift and give more of your attention to leading through others, don’t forget how to still be a great manager too. 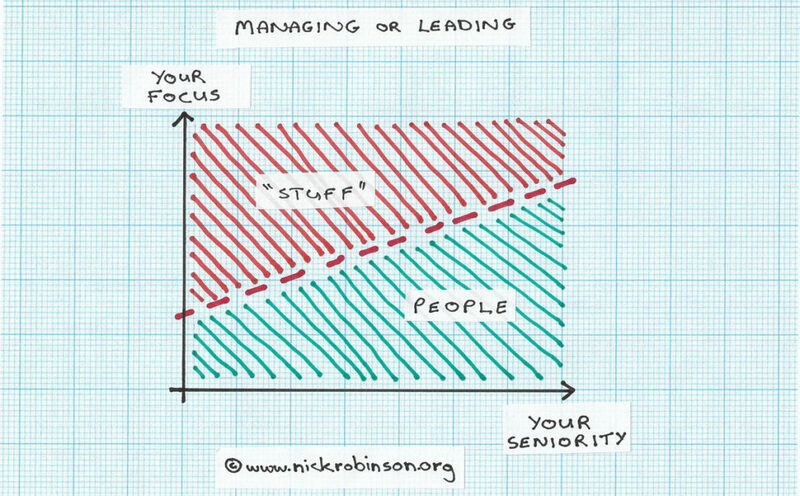 http://www.nickrobinson.org/wp-content/uploads/2018/08/Managing-or-leading.jpg 743 1200 Nick http://www.nickrobinson.org/wp-content/uploads/2017/03/NR-Web-Logo-trans-3.png Nick2018-08-17 10:57:352018-08-17 11:05:09Managing or Leading?